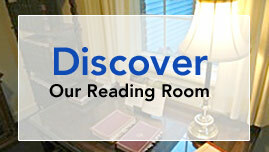 SPECIAL OFFER: COME INTO THE READING ROOM AND ASK FOR A FREE COPY OF THE CHRISTIAN SCIENCE SENTINEL MAGAZINE! 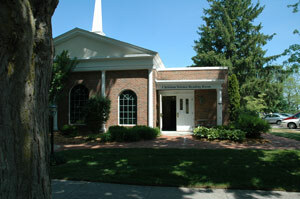 Monday through Saturday 11:00 AM to 2:00 PM and after church services. Located next to the church on 6th Street. The Reading Room is a great place for anyone to find out about spiritual healing with books and resource materials to borrow, buy or study. Our staff will be happy to give you a tour of the Reading Room and answer any questions you might have about Christian Science. We’d love for you to stop by! See our upcoming events. * Copies of the Bible, various Bible translations, Bible dictionaries, concordances, and other reference works for Bible study. * The Christian Science textbook, Science and Health with Key to the Scriptures, by Mary Baker Eddy, the discoverer and founder of Christian Science. We also have all of her other writings and many biographies by a wide variety of authors. * Products for kids. They can discover more about the Bible, God, and God’s love for them as His precious children! * Gifts—Everything from notecards to inspirational music. * The Christian Science Monitor: a Pulitzer Prize winning, international daily online newspaper and weekly print magazine consistently ranked by professional journalists as one of the top 10 newspapers in the world. * The Christian Science Journal (Monthly publication): instructive articles to help you understand more about God, plus verified reports of Christian healing through the study and application of Christian Science. *The Christian Science Sentinel (Weekly publication): The articles, editorials, and firsthand accounts of healing show in practical terms how Christian Science can bring healing to any situation. 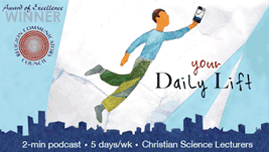 * Christian Science Bible Lesson: A daily resource for comfort and support. Each Lesson consists of Bible verses, amplified and explained by related passages from Science and Health with Key to the Scriptures.